ANIVRAM REPRESENTING SNEAKER CULTURE: Lacing Problems? Look no further! Ever wish your sneakers looked like this? Sneaker Freaker covered this almost two years ago, but it is as important now as ever. Lacing is a huge problem for many people, and some Sneaker heads just simply aren't aware that more can be done with laces to style your shoes than a simple one color criss cross. Adjacent to this paragraph is a lattice lace style, one of 33 ways to tie your shoes with one pair of laces! Take some time to check out the original post at Sneaker Freaker here, and Ian Fieggen's (aka Professor Shoelace) site here, where he constantly updates new, in detail ways to tie your laces. Everything from bi lacing to single lace styles are there. 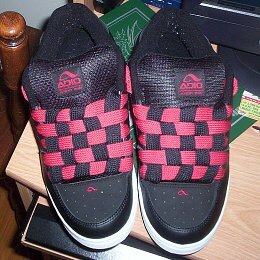 Below is one example of finished bi laced checkerboards.